After a slow start What? provides answers. Attack Theatre performs "This Is What." Photo courtesy of Brian Cohen. 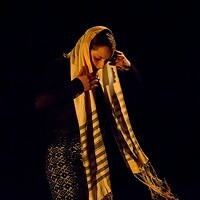 For its latest dance work, What?, Attack Theatre invited audiences for three nights to witness its creation as a work-in-progress, and offer feedback. Starting on Sept. 23, creation gave way to performance in the project's second phase, entitled "This Is What." Inspired by fast-paced TV detective dramas like the CSI franchise, Attack's Strip District studio/performance space was transformed into a crime scene, with police tape and the outline of a body on the floor. The program began with musician/performer Stu Braun carrying out the inert form of dancer Liz Chang and arranging her within the chalk outline as the rest of Attack's six-member cast filed past like investigators. Keeping with the motif, dancer Dane Toney wrote in chalk on a back wall, "Season One, Episode One." The episodes were more like snapshots of familiar crime-show storylines involving the motives for murder, such as passion, greed and revenge. But instead of a fast-paced drama, season one was delivered at a leisurely pace, with performers often acting like spectators to the work they were in. Actual dancing was sparse, and the music felt uninspired. The first act's lone saving grace was a clever twist on a game of hangman. As dancer Simon Thomas-Train hung from a makeshift noose, Toney drew the puzzle in chalk on a rear wall as three dancers offered clues. Nearing the game's end, Toney instructed the audience to call him on his cell phone to fill in the final letter of the puzzle, which, once solved, read "Sorry" -- a suicide note from Thomas-Train's character. Otherwise, however, had this been an actual TV crime drama, season one might have left the show on the brink of cancellation. Fortunately, season two took things from CSI: Dullsville to the more innovative, entertaining and action-packed heights we've come to expect from an Attack production. This second act burst with energy, with a bevy of fabulously performed athletic dance sections, including one where Attack's dancers used a wall to bounce off of, hang from and create a series of interesting crime-scene tableaus. Adding to that was more chalk magic in the form of word games, and a lively bit where imaginary arrows shot a chalk apple off a dancer's head. Attack Theatre performs WHAT?--THIS IS WHAT 7 p.m. nightly Thu., Sept. 29-Sat., Oct. 1. Spring Way Center, 2515 Liberty Avenue, Strip District. 1-888-718-4253 or attacktheatre.showclix.com.